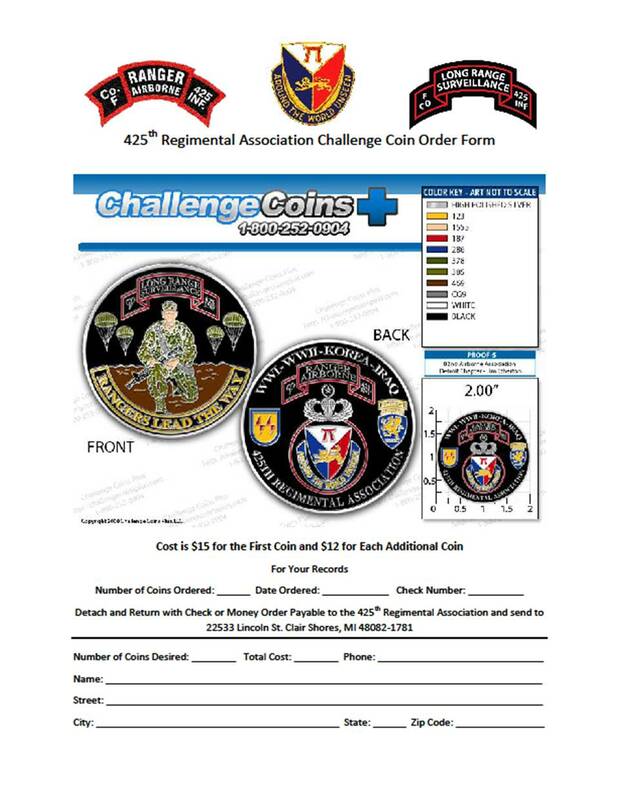 To order a 425th Regimental Association Coin, click on the picture below to download an order form. Complete the form and send it in with your payment according to the instructions on the form. I was interested in buying 3 unit coins. I live in St. Clair Shores and was wondering if I could stop by and pick up the coins and pay for them then. I stopped by your house a few weeks ago and no one was home. You can contact me at ryansmith89@yahoo.com. Hope to hear from you soon. thanks for your time…. I served with F Troop (Co F) from 1985-1989. I am proud to becomming a member of 425th Regimental Association. Welcome Home Fellas! Just found your web site. Can I still order challenge coins? Coins are still available. Click on this link http://425regiment.org/?page_id=453 to download the form to mail in your order. Lookin’ for some of the older coins from the late 90’s. I bought a few when they were available, but I can’t find them now. Anyone have any they want to sell?